The City Parks Association, an advocacy group founded in 1889 which supported the creation of public parks and playgrounds in Philadelphia, published this Special Report in 1902. 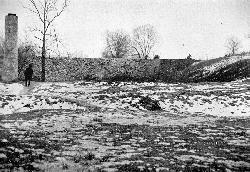 The authors severely criticized what they call the city's "gridiron" system of streets, especially the effect of such a rigid plan on the natural landscape and topography. The many illustrations show how destructive such a system tends to be, and how even slight devitations from the grid can be a great improvement. One irony is this report's praise for curving streets. 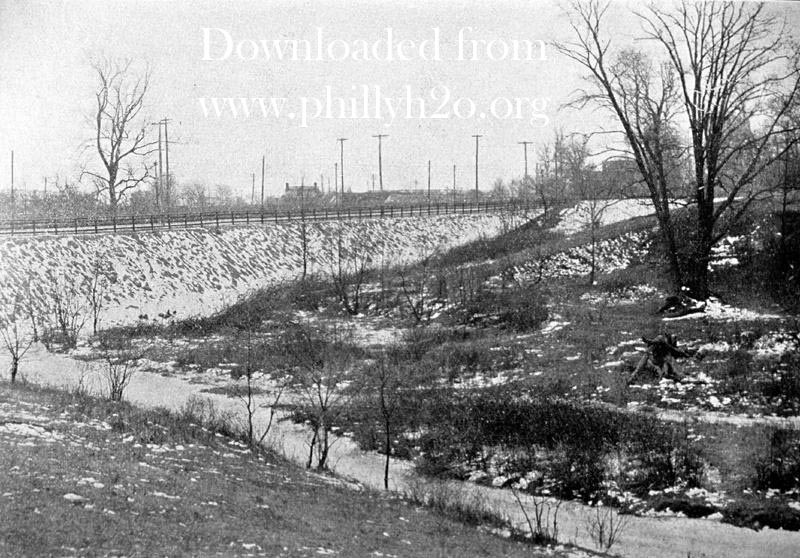 A number of the examples illustrated, including Belfield and Ogontz avenues, were built on top of sewers that had been laid to capture streams. 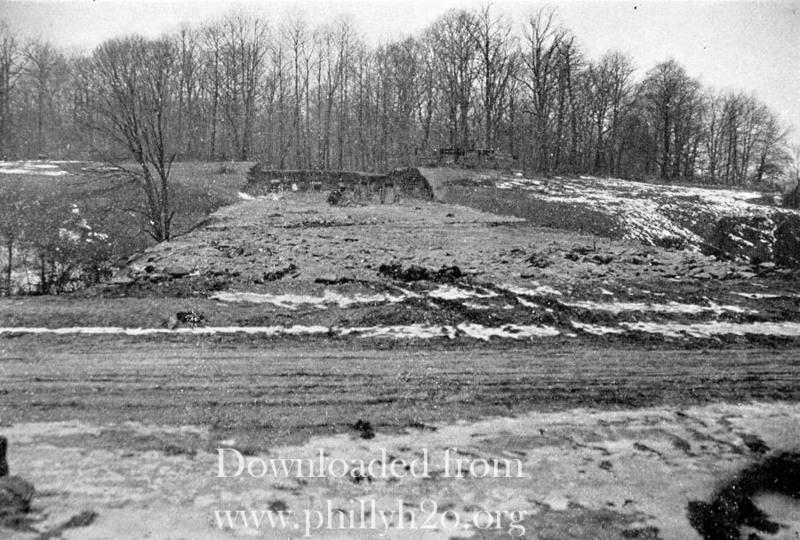 With the creeks thus obliterated, the valleys were evened out with up to 50 feet of fill, and then the streets could be laid right across the valleys without the extra expense for bridges or other stream crossings. Perhaps the authors of the report realized what they were praising, and hoped that by encouraging curving deviations from the rigid plan - no matter what their original intent - they would see future streeets built that would meander alongside streams, rather than on top of them. In time, the city planners caught up with this philosophy, but it was too late for most of this gridded city, and too late for most of the city's natural features. 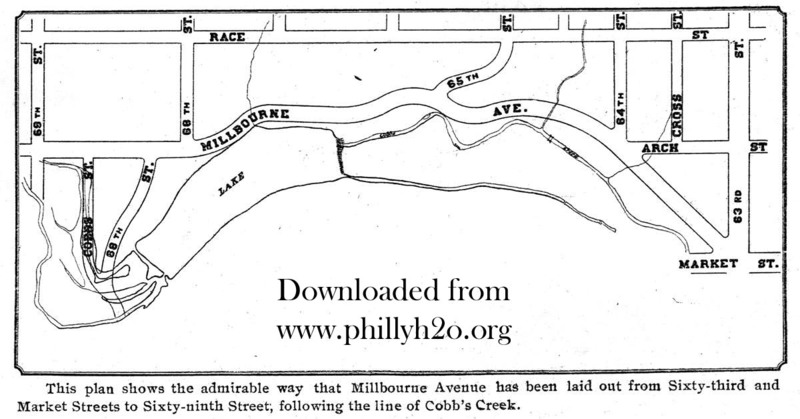 The series of three historic vs. modern streams maps, found at the Creek to Sewer link to the left, speaks volumes about the city-building process in Philadelphia. The City Parks Association of Philadelphia presents herewith a special report on the city plan. It recognizes that much that has been done has been well done, and that much that has been ill done cannot be undone, but it believes that similar mistakes can be avoided, as the city spreads into the suburbs, and that it is not too late to correct a few of the mistakes that have been made. The example set by William Penn in his plan of the city of Philadelphia has been somewhat unfortunate in some of its results. Its particularly good feature has not been followed at all systematically, while its least desirable feature has been perpetuated, extending with the city's growth. In his scheme, a reproduction of which is presented with this report, the most striking characteristic is the amount of open ground deemed necessary. 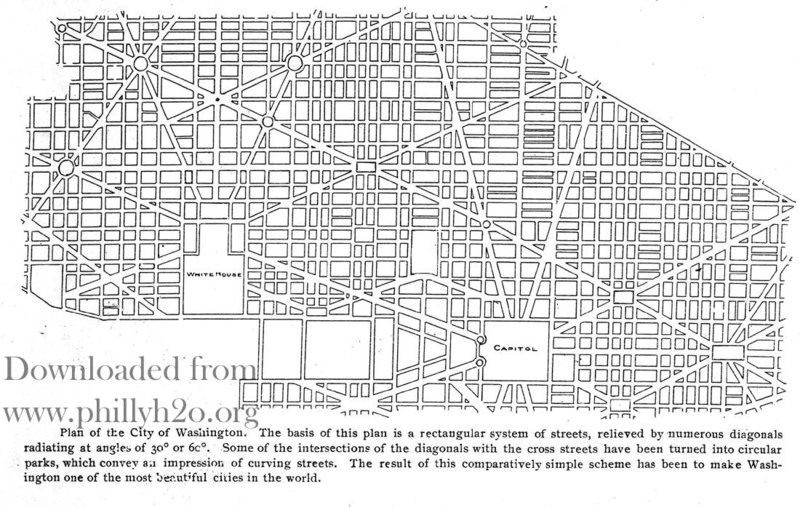 Five squares, and those squares half as large again as the ordinary blocks, were plotted for the space between the Delaware and Schuylkill Rivers, and Vine and South Streets. Had the same proportion of small parks in the thickly built-up portions been secured as the city progressed beyond those limits, as the framers of the Consolidation Act of 1854 directed in that Act should be secured by the Councils of the enlarged city, we should today have 280 small parks instead of the 45 actually on the city plan, and this Association would have had no reason for existence. But that far-sighted provision of the Consolidation Act was forgotten, and no attempt to carry it into effect was made until less than twenty years ago. But while the advantage of these parks was forgotten or ignored, the other main feature of the plan, the straight streets and square blocks, without a curve, or a diagonal, seized hold of the public's mind with a grip that has apparently been little diminished by age. On goes the gridiron, chafing when it has met natural roads of travel too well settled to be vacated, but throwing its severe mantle of unloveliness over these roads, using them as bases for new squares on squares. And we shut our eyes when Broad Street in its unbending progress came close to the Old York Road and its lovely, rolling, winding course, and refused its coaxing and pushed Broad Street ever straight onwards, without end or object. So long has the gridiron system exercised its baneful influence that many, generally well-informed citizens believe that the city plan cannot be changed, or, if it can, that it will take an enormous amount of energy to do so. Perhaps it may be claimed that the majority of citizens have that impression. That is an illustration of the fact that what is impossible in physical things is possible in mental things. It is a smoke without the smallest spark. Any street on the plan may be changed by precisely the same method as it was first adopted: by an ordinance of Councils. And not only may the plan be changed, but it is changed constantly; but nearly every change is to substitute one straight line for another. Streets that have been plotted are changed, streets that have been opened are vacated, actually, every day. It is like chasing a bug-a-boo to say so, but that bug-a-boo must be chased beyond further possibility of mischief. 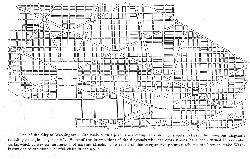 The force of Penn's example was shown in the way in which the outlying settlements copied the general plan of the city. At the time of the consolidation of Philadelphia in 1854 there were thirty-one communities within the county, many of them incorporated. 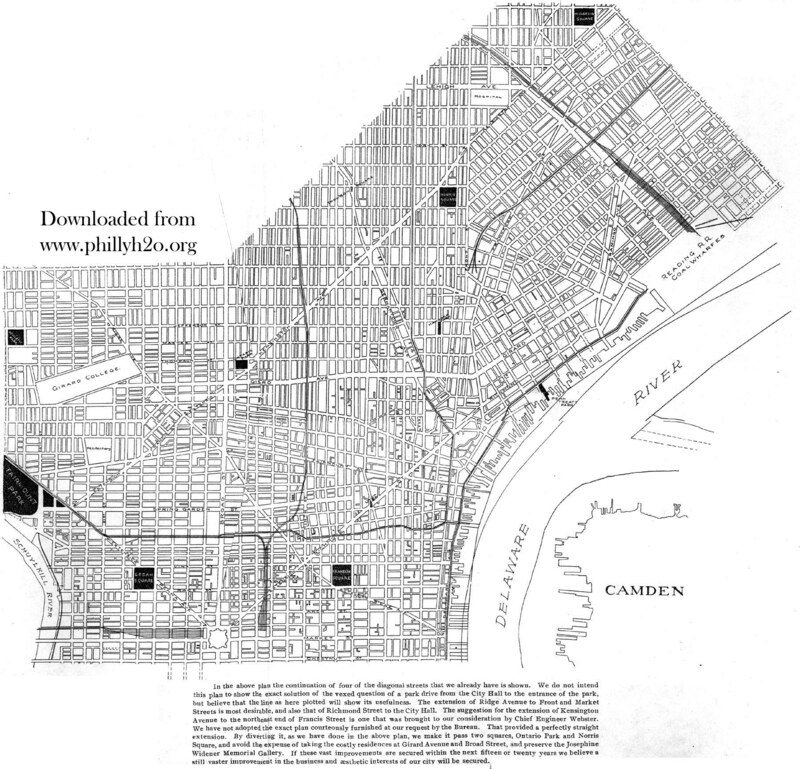 Without the limits of what was then the city of Philadelphia, most, if not all, of these towns had exercised their power of laying out streets, and they were usually plotted with reference to the roads joining them with other communities. When the consolidation took place these roads were put on the city plan; but, while some have been kept, many of them have since been vacated, although they were the roads chosen for their usefulness irrespective of any previously conceived plan. We are speaking here of the roads connecting the communities. In the towns and villages the William Penn plan of straight streets and square blocks was adopted, using the main connecting thoroughfares as bases for the squares. It is curious that the advantage of diagonal streets did not impress itself more thoroughly upon the earliest settlers. The saving of time was perhaps not as important to them as to us, but the manifest inconvenience must have made itself felt long ago. The last generation and our own are more to blame than our ancestors, because the advantage of diagonal streets is visibly illustrated by the few that we have. Ridge Avenue, for instance, is a line of shops - and the shopkeepers go where the travel is. Moyamensing Road, Germantown Avenue, Lancaster Avenue, Frankford Avenue, Kensington Avenue are right before our eyes, and yet some of us ask, what their use is. The experience of other cities points to their desirability from a business point of view, but we refuse to learn. Two or three of the diagonals show the continuing effect of Penn's idea in a signal manner. 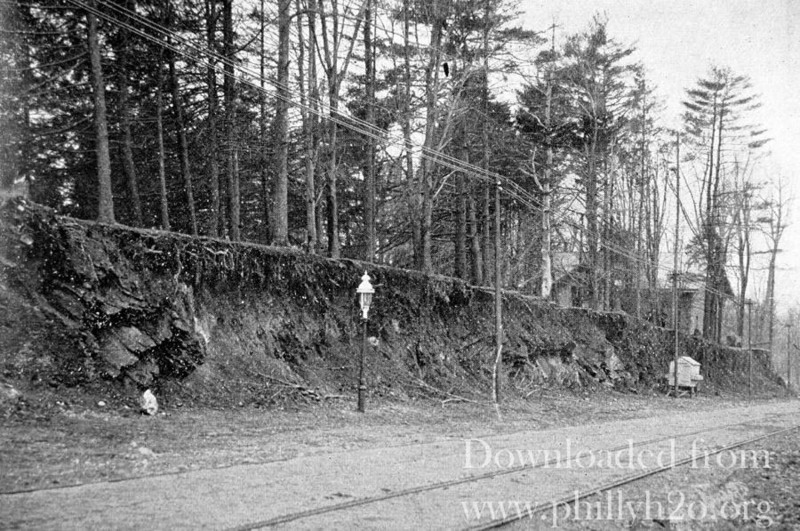 Ridge Avenue connects the formerly separate towns and villages of Manayunk, Falls of Schuylkill and North Penn Village with Philadelphia proper by a diagonal route to the point where it touches the confines of William Penn's city at Ninth and Vine Streets, and there it stops. Into those sacred precincts it dare not enter. And likewise with Passyunk Avenue. It approaches Penn's limits from a southwesterly direction and has the courage to continue a diagonal until it reaches South Street, just east of Fifth. Further it goes not. 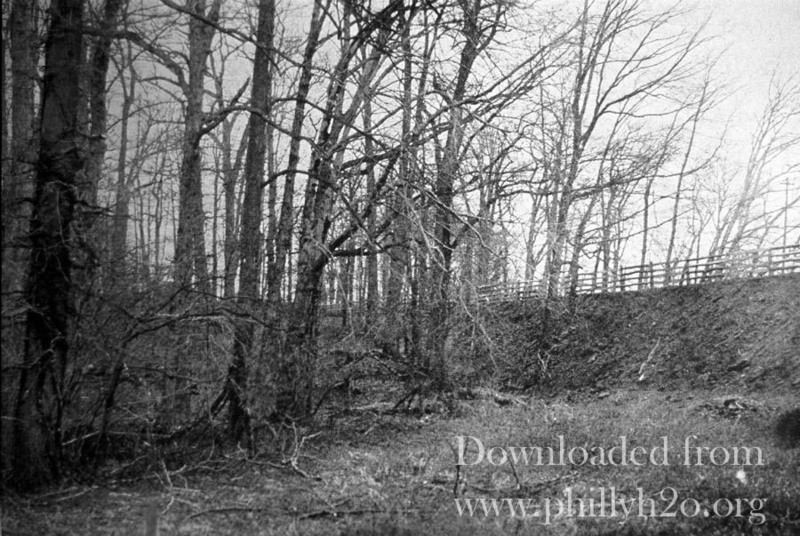 Gray's Ferry Road did not fear the terrors of the Schuylkill, not even during the years 1777-1834, when it crossed that stream by a floating bridge, but it stopped short when it struck South Street at Twenty-third Street. Even the railroads keep straight until they cross, one the Schuylkill and the other Vine Street. But no rule should be without and exception, and, despite the stern edicts of the founder of the city, the impertinent Dock Street winds its small existence through a distance equal to four squares. Would there were other infant prodigies! If Ridge Avenue were continued to the intersection of Delaware Avenue and Market Street, the great congestion of the latter east of Ninth Street would be relieved. Any one riding on the cars must have noticed how slow the progress is between the wharves and Ninth Street. As soon as the cars that turn northward there and the other traffic are gotten rid of, advance is nearly as rapid as in any other business section. Richmond Street likewise should be extended to the City Hall, connecting the center of the city with the enormous business enterprises along the northeastern river front. A great improvement that the Board of Surveys has long been dreaming of is the continuation of Kensington Avenue from its present terminus at Front Street to Broad Street at or near Girard Avenue, whence it could be extended through Francis Street to Spring Garden Street. Kensington Avenue funnels all the traffic from Frankford Avenue, the Bustleton and Somerton Turnpike and the Oxford Turnpike. The advantage of the diagonal suggested by the Bureau is self-evident. A plan showing these extensions will be found at the end of this report. Expensive as these great improvements would be, they ought to be, and can be, secured in the next fifteen or twenty years. 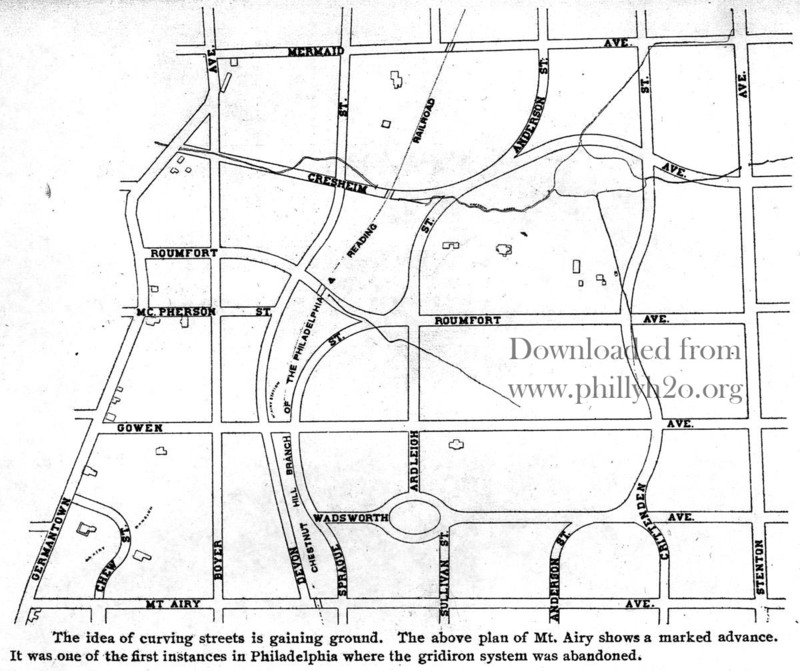 It would not be difficult to adopt in a measure the radial plan of streets for the portion of Philadelphia between the Delaware and Schuylkill Rivers south of the actually built up area. The problem here is much simpler than in the undeveloped sections in any other direction. The ground is level. It may have to be filled up to a grade sufficient for the sanitary purposes of the sewerage system, but its sensible development does not require any consideration of the contour of the land, which in other sections requires most careful thought. 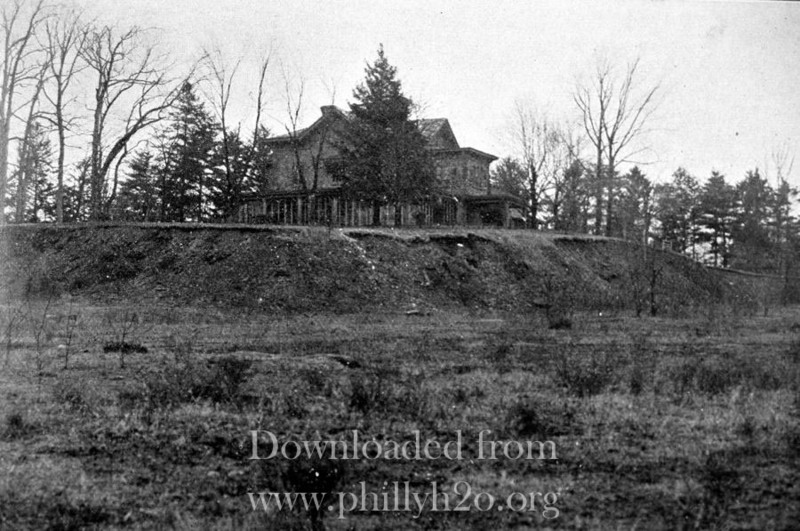 There is submitted herewith a plan for its development, prepared by Mr. Frank Miles Day. It has disturbed the existing plan as little as possible, but we believe it would give admirable results at comparatively small cost. 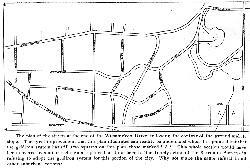 By reference to it, it will be seen that its features are mainly the same as the present ones, with the addition of two short diagonals, with circular parks, of which we have none now, at their intersections with Penrose Ferry Avenue and Southwark Avenue, respectively, and two additions to League Island Park, one of which is already pending - namely, the approach from Oregon Street south. There are also two short diagonals running southeasterly and southwesterly respectively. The Soldiers' and Sailors' Monument should be placed at the entrance of the approach to the Park and other monuments in the circular parks. 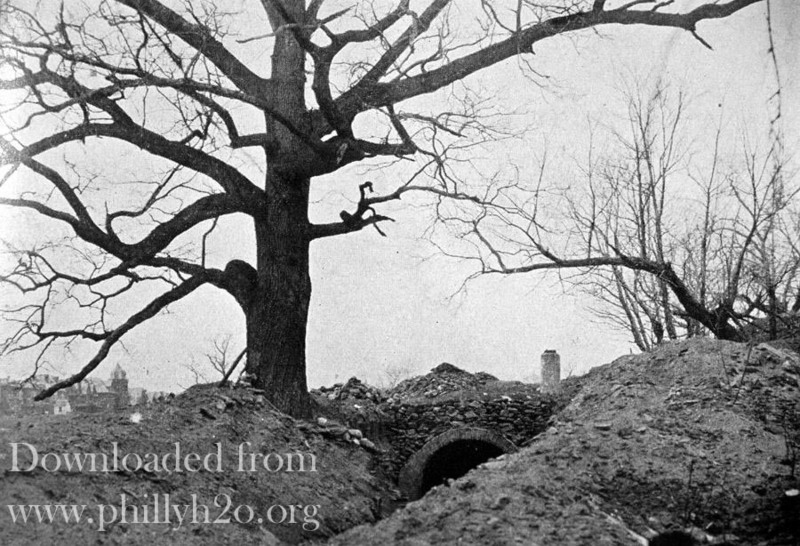 The City Parks Association is convinced that this portion of Philadelphia will be inhabited by working people, and for that reason strenuously urges the adoption of this plan because their surroundings ought especially to be made attractive and beautiful. The radial plan is not in any sense and untried one. It is that of Washington and Paris. Washington is the most beautiful city in America, and there is no reason why its scheme should not be followed in the outlying districts of Philadelphia where the contour permits of it. And where the contour does not permit of this precise scheme, it will seldom demand more than a slight change, affording a variation which is to be sought rather than avoided. It will doubtless happen that individual owners will desire slight changes from this plan, but it is submitted as the one to be generally followed. In our last report the desirability of making Fifty-second Street a connecting link between Bartram's Garden and Fairmount Park was pointed out. But it offers an even greater opportunity. By its continuation to that Garden, and then by the extension of Fifty-third Street to Broad and Johnston Streets, a fine parkway can be secured to League Island Park. It would pass the new park at Fifty-second Street and Pine Streets, lately placed on the City Plan, and Girard Park. A small circular park would improve its intersection with Passyunk Avenue, and give it still more of the character of a park drive, while not interfering with its usefulness. 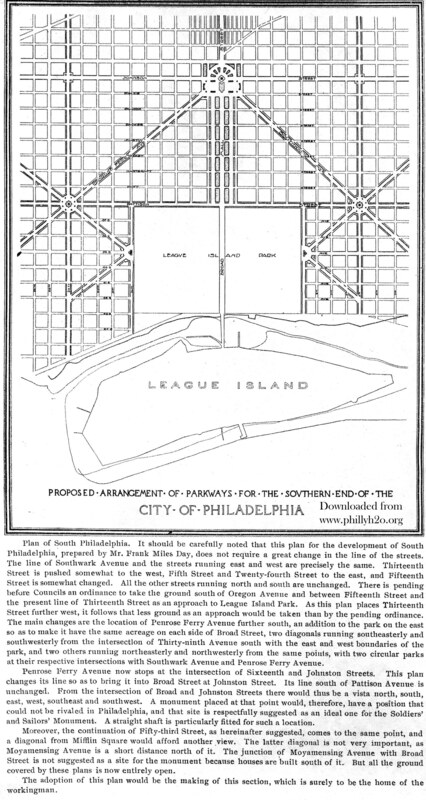 A plan showing this extension and its relation to the suggested development of South Philadelphia is submitted herewith. The Cedar Avenue Improvement Association and the Forty-ninth Street Station Association have accomplished and are accomplishing admirable results, and we especially commend this improvement to their consideration. The legal limits of the City of Philadelphia are quite different from the actual limits; that is, the closely built up portions do not coincide at all with the limits over which its government extends. Much of it is still farming land, truck patches or villas. 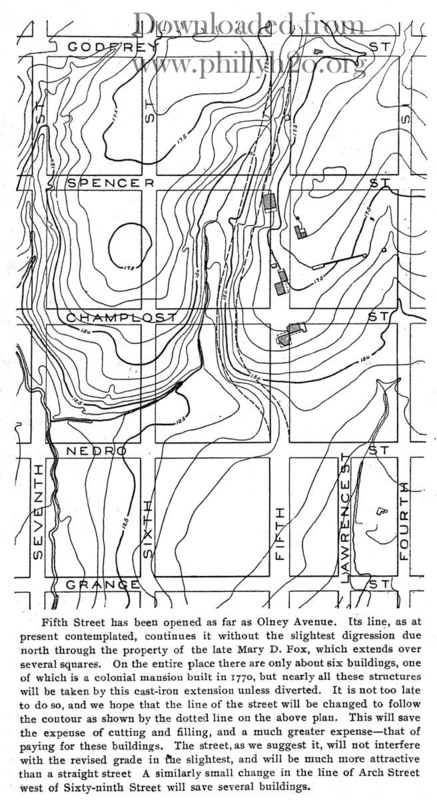 A need is felt for an accurate map that will show what the limits of the city are on the ground as distinguished from its plan on paper, one that will show the streets only that are actually opened, not those that are merely plotted, and that will indicate how far the solidly built up area has extended. Such a map should be published every two years at least. In that way it will be possible to see in what directions the city is extending most rapidly. If the building operations under way as well as those completed are indicated, schools and other necessaries can be secured in time, thereby preventing congestion such as has been caused in the last few years by the great rush to the suburban districts, made possible by rapid transit. As it has the machinery, the Bureau of Surveys should be given the task, with annual appropriations to pay for the extra labor. The maps when published should not be larger than about thirty by forty inches, or at any rate should not be published in sections. 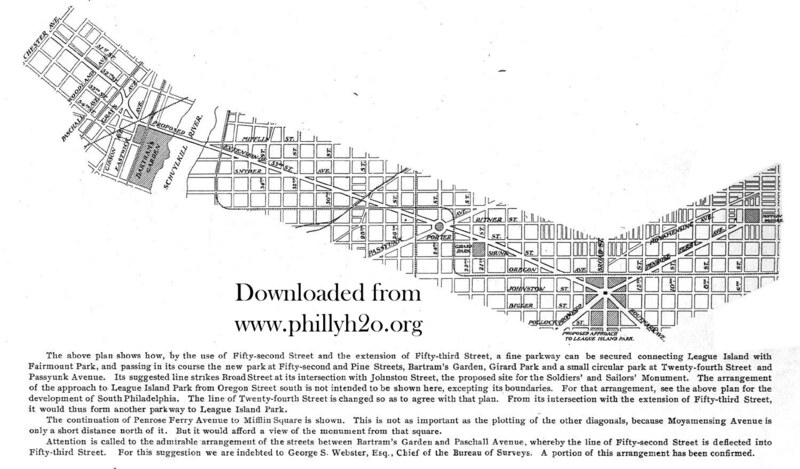 What is wanted is a map that will show at a glance the extent of Philadelphia as it is on the ground. Winding, curving streets are far more picturesque than straight ones, and are particularly delightful for residences, whether for the employer or employed. Curving and diagonal streets give much greater opportunity for diversity of architecture than straight ones do. The main thoroughfares should be straight, and the main business streets are likely to be the straight ones, although in other cities there are some notable exceptions. There is not only no need for a man's home being located on a straight avenue, but it will be more attractive if it is not. The few instances of curving streets that have been secured in Philadelphia emphasize the great desirability of obtaining many more. Through the courtesy of George S. Webster, Esq., Chief of the Bureau of Surveys, we are able to publish herewith plans, some confirmed, some not, showing what has been done recently in this direction. It will be seen that during the last ten or fifteen years there has been a distinct advance in a few localities, principally in the Twenty-second Ward. But the same ideas should be applied to all the suburban wards, and the present city administration and Chief and District Surveyors have shown most clearly that they are ready to do so if the desire of the community is shown. If any individual wants the plan changed let him have a survey made and show it to the Board. He will certainly receive consideration and in the majority of cases, particularly if he owns the whole tract, or represents the owners of the whole tract, his plan will be accepted. Of course careful attention must be paid to the sewerage system, but that can easily be observed. There are herewith presented many illustrations of unnecessary cuts and fills, which could have been avoided by swinging the street to follow the contour. No desire to have that done was expressed by the people of the vicinity, and it was not done. Doubtless the district surveyors have been sometimes at fault, as they could have suggested the changes themselves in many instances. But the fault lies equally with the people. It is hoped that the surveyors will take the initiative, but it is also the duty of the people; and not only their duty, but their advantage. Building operations would be more likely to be successful, whether building the poorest class of homes or the best, if the streets were attractive. The houses show much better on a curve than on a straight line. For park purposes the great advantage of having the streets follow the contour of the land is obvious. Parks bounded by curving streets are much more attractive than perfectly square bits of ground. Where streams are surrounded by hills or high, shelving banks, as most of the Philadelphia streams are, streets running along the summits of the banks or a short distance from them, would not interfere with their natural beauty and would leave them to be taken for parks. 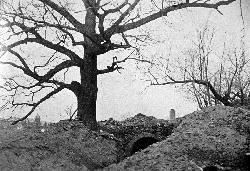 Thus the expense of filling in the hollows would be saved, and there would be preserved for all time the stretches of beautiful scenery by which Philadelphia is at present surrounded, but which will be doomed to absolute annihilation if the streets forge ahead utterly regardless of the destruction they are causing. The expense entailed by pushing streets on a straight line through hilly country is much greater than if they were made to follow the contour. The cost of cutting and filling within the blocks, which is necessary when houses are to be erected, is much greater than the slight addition to the length of street and sewer and consequently to the cost of the street bed itself. That expense of cutting and filling should of course be saved, because Philadelphia has enormous sums to be met annually, and has enormous wants in many directions. An administration is not to be judged by the amount of money that it spends so much as by the return that it gets for what it does spend. The best administration is not the cheapest and any administration will be declared good or bad by posterity according to its results. It is doubtless true that the present administration will be remembered for having begun a solution of our water problem much more than for the cost that that system has necessarily entailed. If this administration had not undertaken the improvement of Philadelphia's water supply, the city's debt would not have been increased so much, but it would not have been a better administration on that account. In the same way, if the natural street and park development is undertaken, the expense of its inauguration may seem great; but the administration that secures that beginning will be praised by the decree of history. In the long run the actual expense of such a system will be in fact less, because of the saving in the expense of cutting and filling and the greater improvement to the whole community. The expense in the beginning would be considerable, because many of the streets in the undeveloped suburbs which have been actually opened ought to be vacated, thereby increasing the expense by the amount that that actual opening entailed. But, if the work of previous administrations and generations has not been well done, the sooner it is gotten rid of the better. For instance, Fifty-ninth Street has been raised to a grade much above the natural level, as is shown by the illustrations; all of that should be completely done away with. 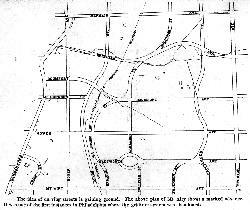 It was totally unnecessary to make any of these enormous banks; because the street by winding around the hills could have kept the same grade and the cross streets could have gone down a gradual incline to Cobb's Creek, the sewers following the same line. Cobb's Creek itself affords a rarely good opportunity for a park, which should run along the whole length of it from City Line Avenue to Paschallville. Most cities would think themselves exceptionally fortunate in having one such stream, and so would we, had we not others like it, as well as the incomparable Wissahickon. But the people of Southwestern Philadelphia, the great mass of them at any rate, will seldom see that famous drive, and it is only just that their own beautiful scenery, within easy access of their homes, should be kept for them. 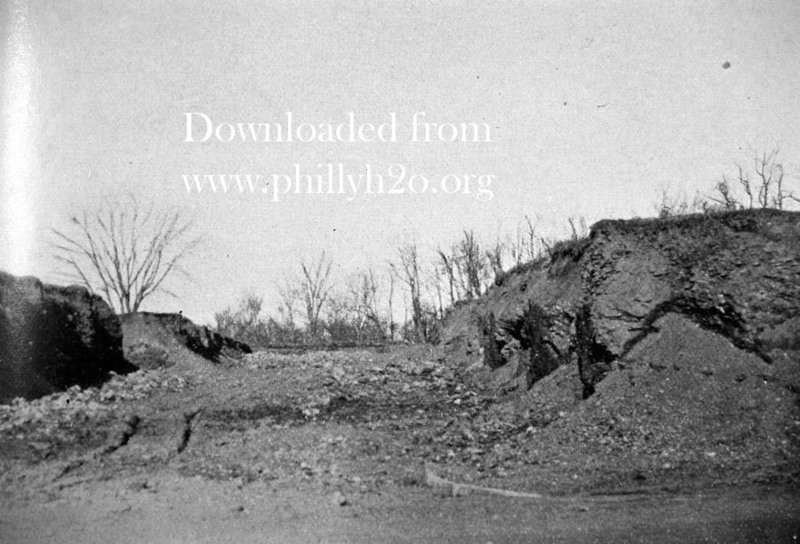 The preservation of this stream and Indian Creek, Sherwood Forest and other natural features, and the adoption of the Washington plan of streets, as the contour permits, would make West Philadelphia delightful; and it will always be within easy reach of the business center of the community. In fact all of the outlying districts of Philadelphia offer opportunities for this sort of improvement, and the people will be alone to blame if they do not obtain it. The plans published herewith, showing where the natural roll of the land has been preserved, are notable signs that the time is ripe for modifying the gridiron system, so as to make the great avenues of trade and business greater, and the streets for the homes of this City of Homes more attractive and homelike. We trust that the reasonable development of the city, having in view its aesthetic and practical needs, will be undertaken in all our undeveloped sections; and that, as time and opportunity offer, corrections of the plan will be made in the built up portion. 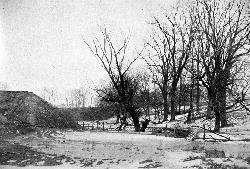 The suggestion, that is, at present, the most prominent one before the public, is that of the Park Road [Benjamin Franklin Parkway] from the City Hall to the Green Street entrance of Fairmount Park. 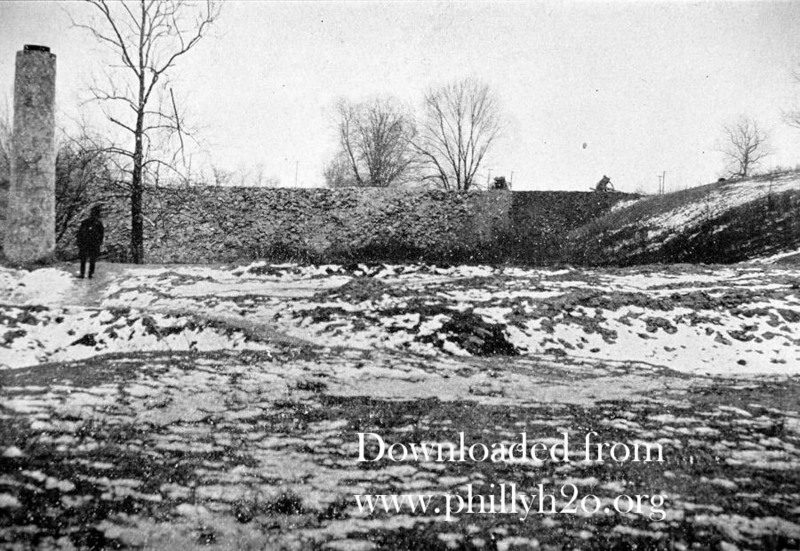 The present administration can secure to itself the credit, not merely of the inauguration of a great betterment in Philadelphia's water supply, but also of the commencement of its rural development in a way that will add to its usefulness, its healthfulness and its beauty-improvements that will bring lasting renown to the administration responsible for them as well as to the city. Scanned either from photocopies or slides of the plans and halftone photographs included in the report. Captions are verbatim; in some cases more descriptive information has been added to the caption headings. Since the Free Library copy of this report was falling apart, illustrations may not be in their original order. diagonals has been carried out in the enlarged city, while the system of small parks has not. A view at Broad and Fisher Streets, showing cuts typical of the results of the gridiron system. attractive boundary would have been preserved. to the level of the street will kill the trees that now rise from the ground below that level. Broad Street and Old York Road as seen from Logan Station. This shows how unnecessary it was to extend Broad Street so far north. It should have been diverted into Old York Road at Cayuga or Wingohocking Street. The idea of curving streets is gaining ground. 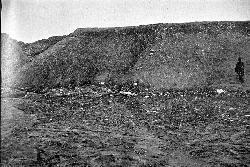 The above plan of Mt. Airy shows a marked advance. 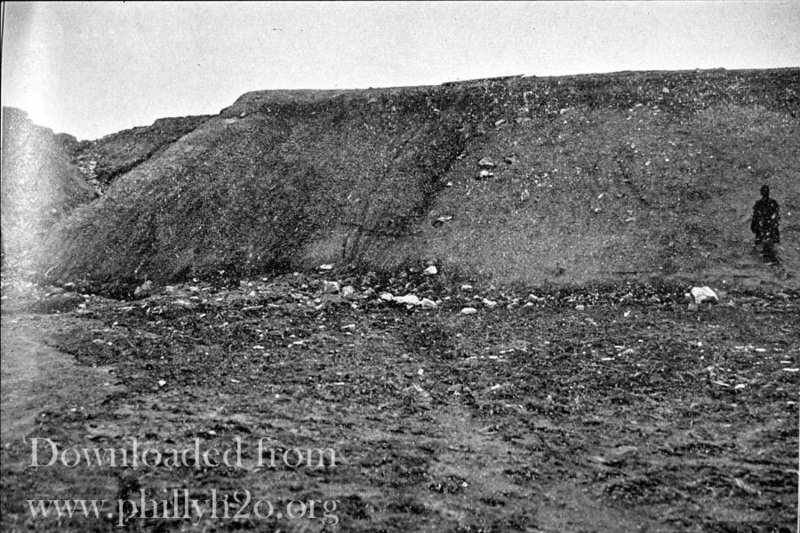 It was one of the first instances in Philadelphia where the gridiron system was abandoned. Good and bad are curiously mingled in the above plan of a portion of the Forty-second Ward. The unnecessary extension of Broad Street is illustrated on the one hand, while, on the other, the attractiveness of winding streets and the usefulness of diagonals are suggested. The winding line of Ogontz Avenue, following the course of a stream, is very commendable and the extension beyond Olney Avenue as a diagonal is likewise attractive. 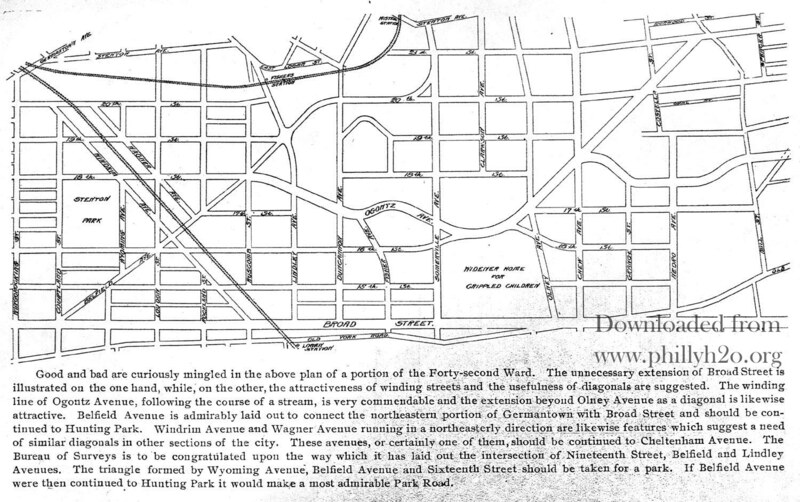 Belfield Avenue is admirably laid out to connect the northeastern portion of Germantown with Broad Street and should be continued to Hunting Park. Windrim Avenue and Wagner Avenue running in a northeasterly direction are likewise features which suggest a need of similar diagonals in other sections of the city. These avenues, or certainly one of them, should be continued to Cheltenham Avenue. 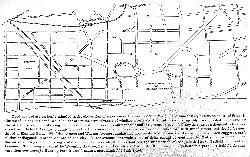 The Bureau of Surveys is to be congratulated upon the way which it has laid out the intersection of Nineteenth Street, Belfield and Lindley Avenues. The triangle formed by Wyoming Avenue, Belfield Avenue and Sixteenth Street should be taken for a park. If Belfield Avenue were then continued to Hunting Park it would make most admirable Park Road. 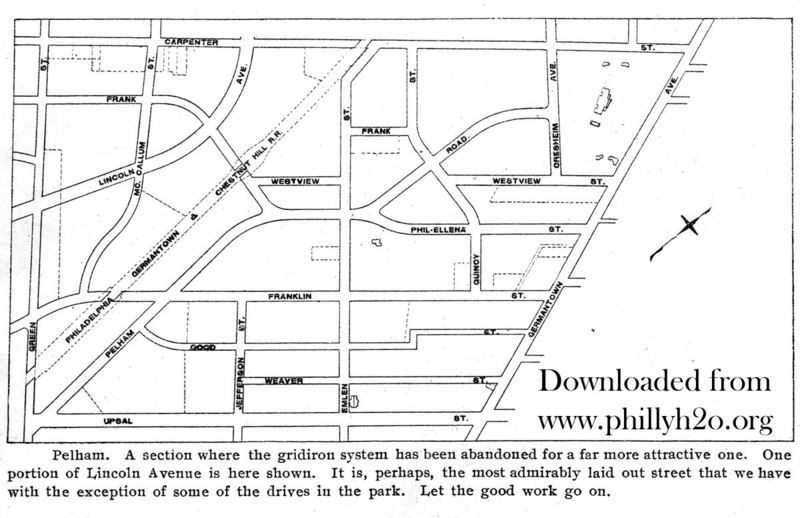 It should be carefully noted that this plan for the development of South Philadelphia, prepared by Mr. Frank Miles Day, does not require a great change in the line of the streets. The line of Southwark Avenue and the streets running east and west are precisely the same. Thirteenth Street is pushed somewhat to the west, Fifth Street and Twenty-fourth Street to the east, and Fifteenth Street is somewhat changed. All the other streets running north and south are unchanged. There is pending before Councils an ordinance to take the ground south of Oregon Avenue and between Fifteenth Street and the present line of Thirteenth Street as an approach to League Island Park. As this plan places Thirteenth Street further west, it follows that less ground as an approach would be take than by pending ordinances. The main changes are the location of Penrose Ferry Avenue further south, and addition to the park on the east so as to make it have the same acreage on each side of Broad Street, two diagonals running southeasterly and southwesterly from the intersection of Thirty-ninth Avenue south with the east and west boundaries of the park, and to others running northeasterly and northwesterly from the same points, with two circular parks at their respective intersections with Southwark Avenue and Penrose Ferry Avenue. Penrose Ferry Avenue now stops at the intersection of Sixteenth and Johnston Street. This plan changes its line so as to bring it into Broad Street and Johnson Street. Its line south of Pattison Avenue is unchanged. From the intersection of Broad and Johnson Streets there would thus be a vista north, south, east, west, southeast and southwest. 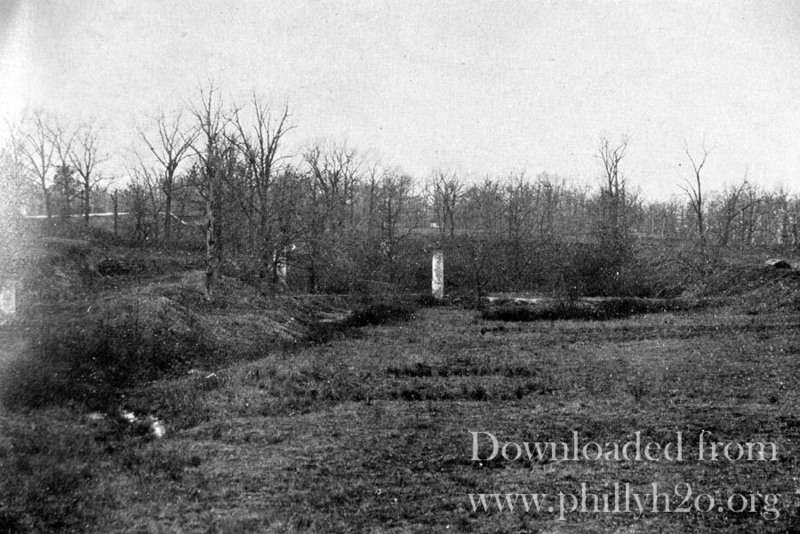 A monument placed at that point would, therefore, have a position that could not be rivaled in Philadelphia, and that site is respectfully suggested as an ideal one for the Soldiers' and Sailors' Monument. A straight shaft is particularly fitted for such a location. Moreover, the continuation of Fifty-third Street, as hereinafter suggested, comes to the same point and a diagonal from Mifflin Square would afford another view. The latter diagonal is not very important, as Moyamensing Avenue is a short distance north of it. 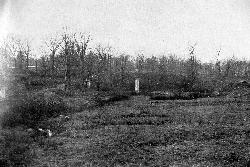 The junction of Moyamensing Avenue with Broad Street is not suggested as site for the monument because houses are built south of it. But all the ground covered by there plans is not entirely open. The adoption of this plan would be the making of this section, which is surely to be the home of the workingman. Sixty-ninth Street, following the line of Cobb's Creek. suggestion we are indebted to George S. Webster, Esq., chief of Bureau of Surveys. A portion of this arrangement has been confirmed. A section where the gridiron system has been abandoned for a far more attractive one. One portion of Lincoln Avenue is here shown. It is, perhaps, the most admirably laid out street that we have with the exception of some of the drives in the park. Let the good work go on. 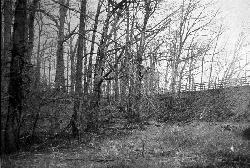 the greater pity that the same idea was not followed in the smaller valley of the Mineaska Creek. 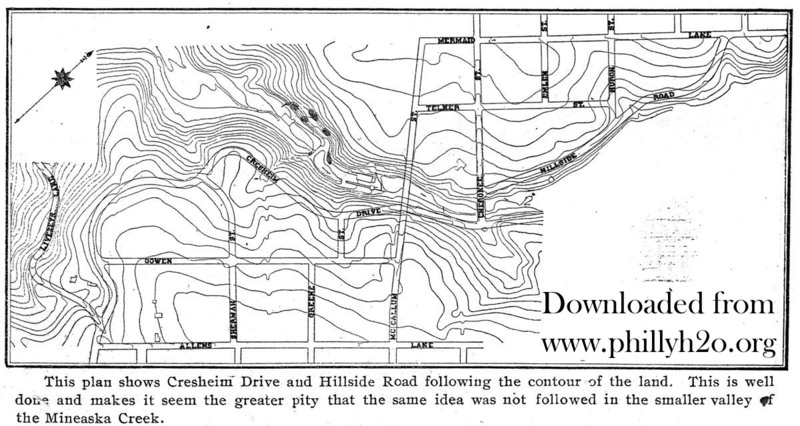 The plan of the streets as the end of the Wissahickon Drive, following the contour of the ground and its slope. The greatest improvement that this plant illustrates can readily be understood when it is pointed out that the gridiron system has still two squares on this plan, those marked A. 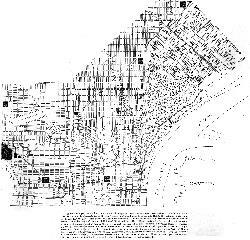 This whole section would have been covered by similar rectangular squares has it not been for the timely action of the Bureau of Surveys in refusing to adopt the gridiron system for this portion of the city. Why not make the same refusal in all other suburban sections? In the above plan the continuation of four of the diagonal streets that we already have is shown. We do not intend this plant to show the exact solution to the vexed question of a park drive from the City Hall to the entrance of the park, but believe that the line as here plotted will show its usefulness. The extension of Ridge Avenue to Front and Market Streets is most desirable, and also that of Richmond Street to the City Hall. The suggestion for the extension of Kensington Avenue to the northeast end of Francis Street is one that was brought to our consideration by Chief Engineer Webster. We have not adopted the exact plan courteously furnished at out request by the Bureau. That provided a perfectly straight extensions. 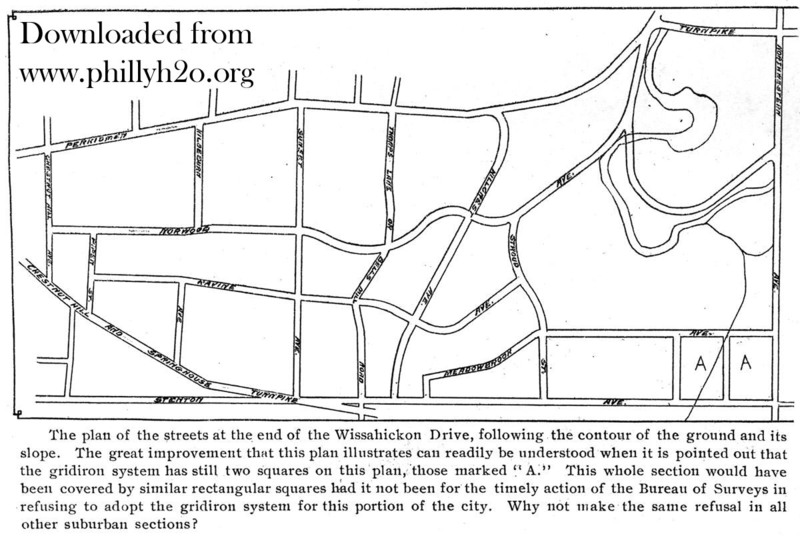 By diverting it, as we have done in the above plan, we make it pass two squares , Ontario Park and Norris Square, and avoid the expense of taking the costly residences at Girard Avenue and Broad Street, and preserve the Josephine Widener Memorial Gallery. If these vast improvements are secured within the next fifteen or twenty years we believe a still vaster improvement in the business and aesthetic interests of out city will be secured. will not interfere with the revised grade in the slightest, and will be much more attractive than a straight street. A similarly small change in the line of Arch Street west of Sixty-ninth Street will save several buildings. 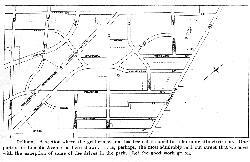 The basis of this plan is rectangular system of streets, relieved by numerous diagonals radiating at angels of 30 degrees or 60 degrees. Some of the intersections of the diagonals with the cross streets have been turned into circular parks, which convey an impression of curving streets. The result of this comparatively simple scheme has been to make Washington one of the most beautiful cities in the world. The above illustration shows the ruthless and unnecessary cuts that have been made around a residence fronting on Old York Road a short distance from Logan Station. The ground that is left is certainly not in any way as desirable or as attractive for building purposes as the ground originally must have been. 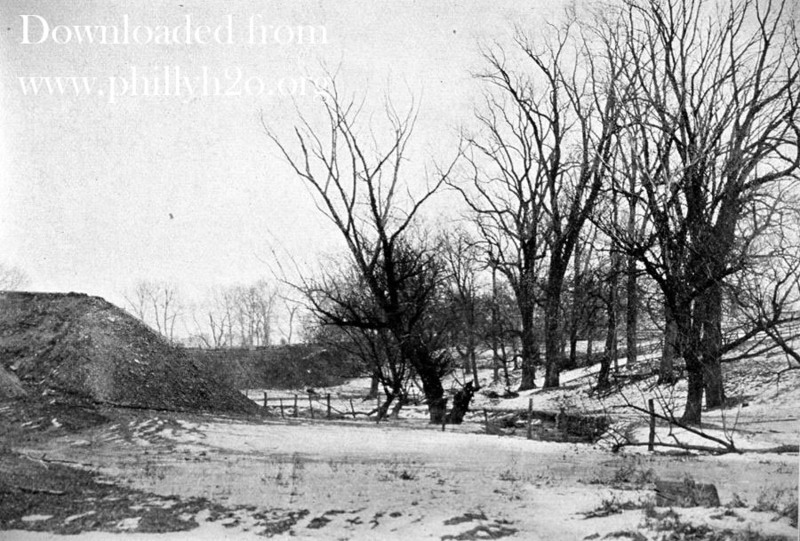 A view of Mineaska Creek [Thomas Run], a few hundred feet from its junction with Cobbs Creek. The advance of 59th Street is shown on the left, and 58th Street can be seen in the distance. 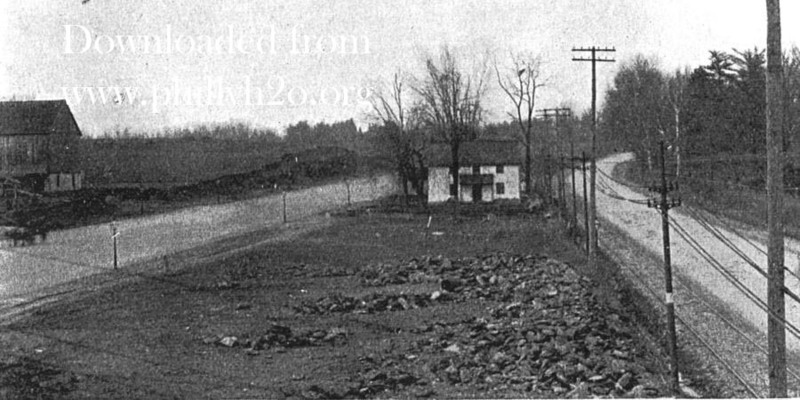 Fifty-ninth Street should be stopped where it is and a street laid out from 58th Street, following the curves of this small stream and saving the group of trees shown on the right. Baltimore Avenue and Fifty-fifth Street. Christian Street, west of 55th Street, showing a typical cut and likewise typical disregard of natural beauty. It is going straight for the heart of Sherwood Forest. 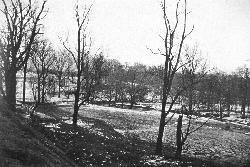 If it had been graded on an easy incline from 55th Street to within three or four feet of the level of the bottom of the manhole showing in the frontispiece and had curved to the north up the other side of this small valley, Sherwood Forest would not have been threatened and the greater part of the expense of the cuts and fills, borne by city and citizens, would have been avoided. A typical result of the gridiron system of streets. 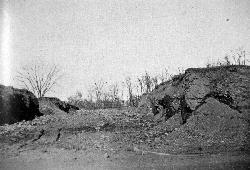 The large fill marks the line of Christian Street, west of 55th Street; the manhole on the left that of Catharine Street. The city will have to pay for filling the latter to the top of the manhole, while the abutting property owners will have the expense of filling some of their ground to the level of the cellars, and all the rest, to and above the top of the manhole. The above illustration shows the main sewer in 57th Street and the level of the street, indicated by the top of the manhole. The fine old oak tree will be destroyed, although it could have been saved by swinging the street slightly to the northeast. A view between 56th Street and 57th Street from Whitby Avenue, showing the amount of filling that city and citizens will be compelled to do, because a street was not laid out following the line of Mineaska Creek and the streets crossing it were not graded down to such street. 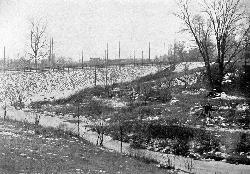 Mineaska Creek [Thomas Run] is a tributary of Cobb's Creek and flows into it at 60th Street and Florence Avenue. 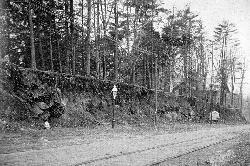 Its line should have been preserved, and the stream itself as far as possible, as an approach to a drive and park along Cobb's Creek. If it were thought necessary to have a level street across the Creek at one or two places, bridges could have been built. The lower portion of this valley can still be preserved. 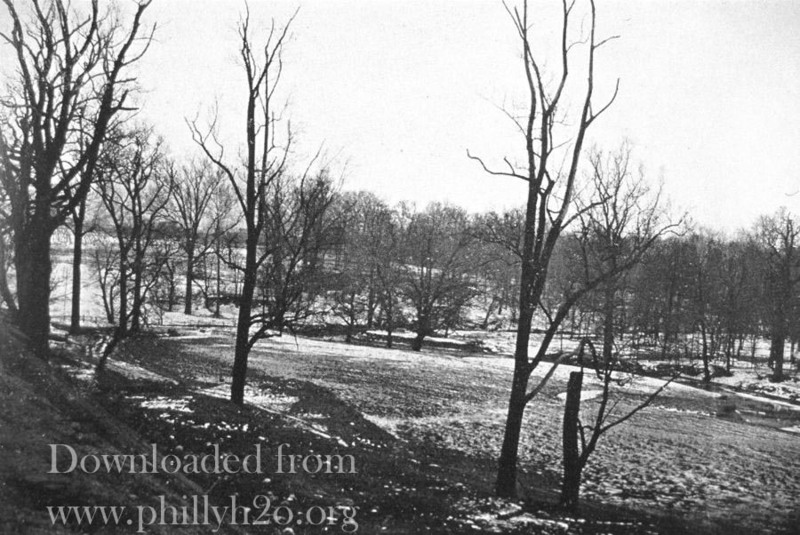 From the top of the fill shown in the preceding illustration this view of the valley of Cobb's Creek can be obtained.